Why do many present-day Islamist movements always seek their own demise? Why do they consistently insist on “all or nothing”? Salafist jihadism today matches India’s Deobandi movement. Salafis today are not even one. It was King Abdulaziz, founder of the Saudi state that celebrated its 82nd National Day recently, who revived contemporary Salafism. He was a true Salafi, but he was also a politician who cajoled the big shots and cultivated the minnows but always came out on top. Before the distortion of Salafism and jihad through abuse by ultraconservatives of these two noble traits of Muslims, every Muslim activist sought to reconcile Salafism, or faith advocacy, and jihad. Salaheddin el-Ayyoubi, better known in the Western world as Saladin, and Imadaddin Zengi before him, were like that – Salafi jihadists. Both used beyond measure tactics of modern-day Islamist movements to mobilize the faithful for jihad. They propagated jihad through preachers and orators -- not only in mosques on Fridays but at all times and on all occasions. They built efficient local administrations in Damascus, Aleppo and Cairo. They were merciful to people and gracious in their sermons. They were benign in their promotion of virtue and prevention of vice. They were also ruthless when they needed to. Imadaddin Zengi was hard-hearted when fighting local leaders. In the end, Imadeddin Zengi and Saladin succeeded in building two nation-states that outlived them by years. They laid the foundations for an Islamic revival movement. In addition to introducing administrative reform, they handed down a plethora of schools, hospitals, markets, castles and public facilities that are still standing today. (Some of these are currently being pulverized by the Syrian regime’s tanks and warplanes). In other words, Zengi and Saladin did not simply lead a fleeting protest movement such as al-Qaeda and the likes that always seek their own demise. 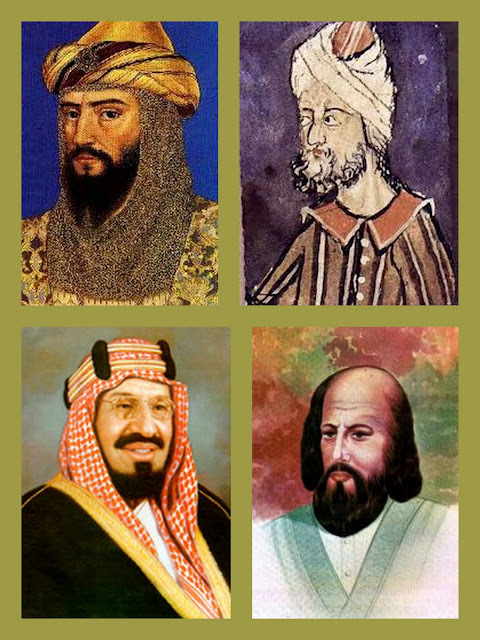 In modern history, Abdulaziz al-Saud emulated Zengi and Saladin. He surrounded himself with local leaders who outmatched him in wealth, political maneuver and international connections. He was fenced in by a Great Power when turning east, south, north or even west to look across the sea to Egypt. He also had to put up with a group seeking it own demise. His valiant military commander Faisal al-Dwaish kept striving to challenge the British, who were then protectors of the Gulf, Iraq and Transjordan. Dwaish ultimately defied his leader and ended up dying in jail with history remembering his insubordination more than his military heroics. I remembered King Abdulaziz when hearing the leader of Somalia’s al-Shabab pledge that his militiamen won’t stop their advance before reaching Nairobi and Addis Ababa, having overcome Ethiopian forces in their country in 2006. Al-Shabab could have instead focused on building Somalia and sinking their roots deeper at home. Had they done that, they would probably have been ruling a stable and secure Somalia. The leader in question might have been negotiating with the Dubai Port Authority to build a port in Kismayo followed by a franchise fishing deal with a Japanese company. Instead, he said last week his Islamist militants were abandoning their last major bastion, Kismayo. This makes me wonder again: Why do many modern-day Islamist groups always seek their own demise? They antagonize everyone far and near as soon as they score a victory. In Libya, they trumped their opponents by joining the revolution. They then proceeded to desecrate graves at (Commonwealth) war cemeteries and attack the U.S. embassy. By so doing they turned people against them, eventually losing their reputation, their weapons and their camps. In Tunisia, they were released from jail, had a taste of freedom and enjoyed it, then abused it and decided that Tunisians, as apprentices in modernity, needed guidance. Those were the same Tunisians who a month earlier had voted into power a moderate Islamist party. They ended antagonizing Tunisians and their government who subsequently demanded their eradication. In Yemen, they absented themselves from the transition process that removed the tyrant they were fighting. They failed to appreciate that the sea change taking place in the country presented them with an opportunity to end their cocooning. Instead, they want their jihad to last for all eternity. Their latest reaction was a suicide bombing in Abyan. In Egypt, they stand out as first class debaters. They joined the constitution-drafting body (otherwise known as the Constituent Assembly). Instead of leaving their imprint on a historic legacy, they focused on such trivialities, as “girls can be married as soon as they reach puberty.” They will surely pay the price of their idiocy at the next elections. I can go on recounting innumerable telltales from Mali, Afghanistan, Iraq and my own homeland Saudi Arabia. The self-interest of present-day Islamist movements invariably takes priority over the interests of the public. In truth, these militant movements mandate acts of suicide in combat but take their own life in politics.